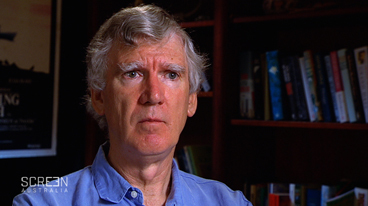 Video clip synopsis – David Williamson wrote the film Gallipoli in collaboration with director Peter Weir. It has greatly influenced modern Australians’ view of this iconic event from Australia's past. David Williamson is an excerpt from the program David Williamson (26 mins), an episode of Australian Biography Series 11 (7×26 mins), produced in 2007. The creation of the Anzac Legend. Australia’s commemoration of World War 1. In this program David Williamson describes his evolution from engineer to playwright, his obsession with writing, the themes and ideas which fascinate him and the way in which he draws on his own experiences of life for his stories and characters. His work usually explored themes from politics and family in contemporary urban Australia. Williamson’s work however also includes film and TV scripts that are not derived from stage drama. One of these scripts, for the film Gallipoli, written in collaboration with director Peter Weir, is derived from the history of World War 1 and has been very influential in modern Australians’ view of this iconic event from Australia’s past. In this clip Williamson explains his motivation for, and intention in, writing about Australia’s involvement at Gallipoli. View Peter Weir’s 1981 film Gallipoli. As you watch, make notes under the following headings. the reasons Australia invaded Turkey. the reasons young men volunteered for service in 1914/15. the attacks at Lone Pine and the Nek. the relationship between soldiers and officers. the qualities displayed by the ANZACS at Gallipoli. compare and share your notes with others in the group. use a dictionary definition of ‘legend’ and your notes to identify qualities or events from the campaign at Gallipoli which fit the definition. Using a concept map, formulate a class definition/description of the ANZAC ‘Legend’. For research: individual, group or teacher directed. When was ANZAC Day first commemorated? How has the commemoration of World War 1 changed over time? What is commemorated on ANZAC Day in the 21st century? View Tolga Ornek’s 2005 film Gallipoli. How is it different from the 1981 version? For what reasons? Some students may be interested in this brief article by Prof. Roger Hillman, Representing Gallipoli on film – from national to transnational myth? Find a copy of Alan Seymour’s play One Day of the Year. When was it set? What was the attitude to ANZAC Day and Gallipoli?